Germany moved nearer to retaining their team title after the cross-country at the European Eventing Championships at Blair Castle, Perthshire. The defending champions' Michael Jung also leads the individual competition. 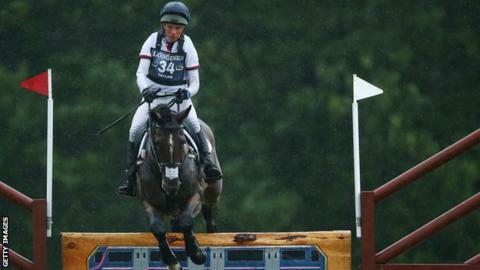 Britain's Izzy Taylor lies in third place overnight after jumping clear on KBIS Briarlands Matilda. William Fox-Pitt retired Bay My Hero after two run-outs in torrential rain, leaving Great Britain second in the team standings in Scotland. "It has just not been my event," he said. "I feel very bad to have let the team down. I am not making excuses." Oxfordshire's Taylor, 32, Olympic champion Jung and Britain's Gemma Tattersall were the only riders out of 64 to go clear inside the time. Jung - who won the Burghley Horse Trials last weekend - leads the individual rankings from compatriot Sandra Auffarth, and can claim a third successive European title even if he has two fences down in Sunday's showjumping round. The German quartet of Jung, Auffarth, Ingrid Klimke and Dirk Schrade are look almost certain to win the team event, with a lead of more than 46 penalties ahead of Britain.